It’s that time of year. Do I mean for drinking wine, or doing Christmas crafts? Probably a little bit of both. Cheers! Don’t worry, I am not skipping over Thanksgiving. I just happened to have an empty bottle left over from bunco night and thought I would do a craft. When I posted the beginning process on instagram everyone was anxious to see it. So here you go. 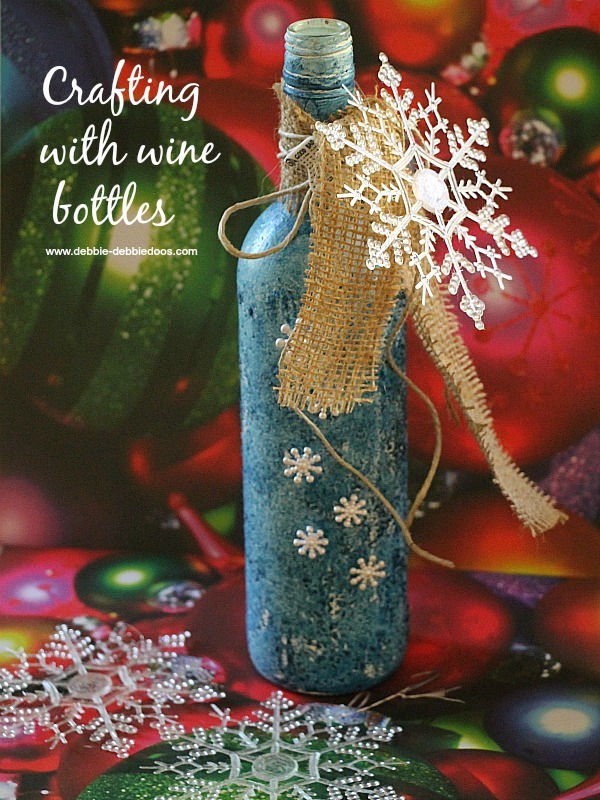 Today, I am sharing a recycled wine bottle Christmas craft idea. 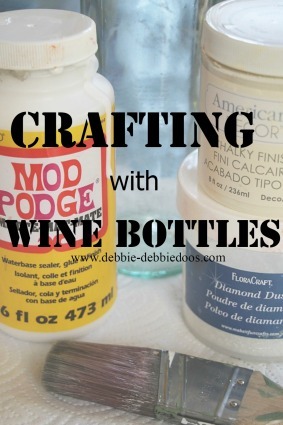 I absolutely love crafting with wine bottles. and you can check those out when you get a chance. First let’s start with the basics. 1st: Drink wine….. soak bottle in soapy warm water to remove the label, and be sure to rinse the inside out well. 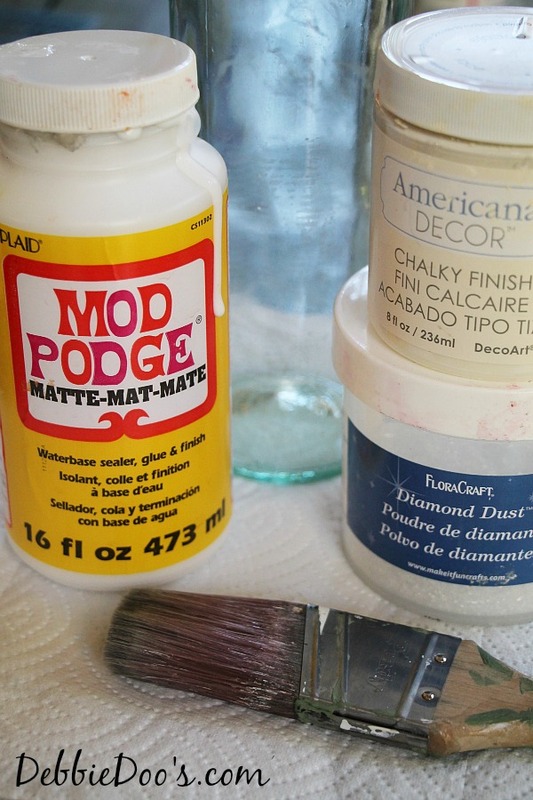 First I turned my bottle upside down and gave it two coats of chalky paint. I let that dry for an hour or so. Let that dry for a few hours. Last year was the first time I have ever used the diamond dust and it looks super cute on glass. 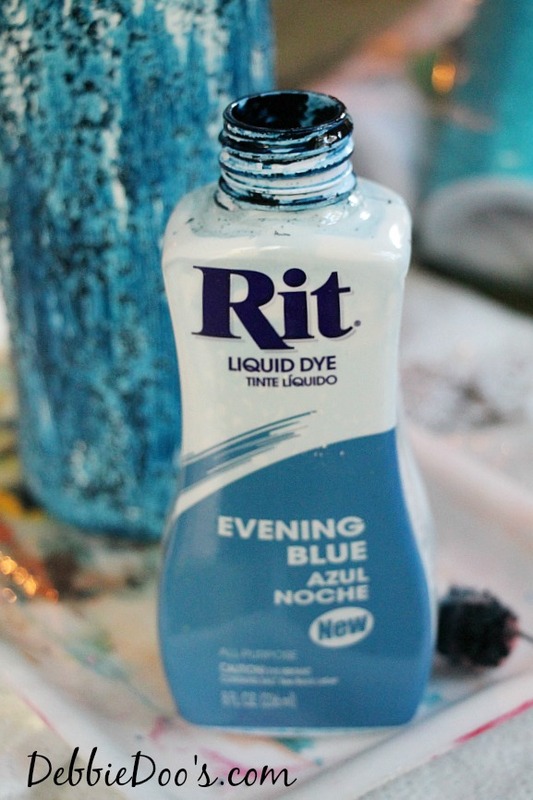 I then took my bottle of evening blue and dipped my foam brush and painted it on the bottle lightly. I dabbed the bottle with a paper towel lightly and let that dry completely for an hour or so. This is what it looks like while drying. After completely dried, I embellished my bottle with button snow flakes, and a cute good bad button. I found the button packs at Michael’s for a dollar. You can add a candle in the opening, you can add some lights inside. Whatever you like or just leave as is. I enjoy the thrill and relaxation of crafting. In fact, I had two crafts going at the same time while my supplies were scattered about the kitchen table. 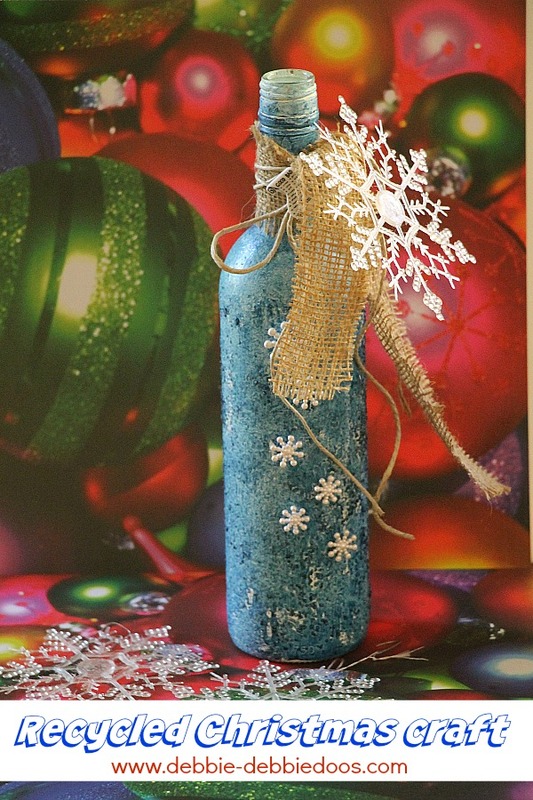 I hope you enjoyed my Christmas recycled bottle craft. I think this will wind up in the family room on the coffee table for the season. Thanks for stopping by today. If you are not a regular here, I sure would love to see you back again. 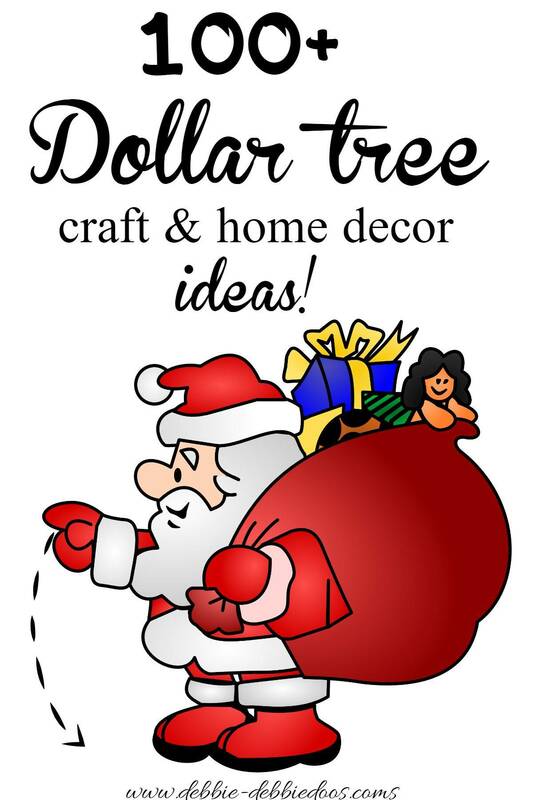 I share an array of budget friendly craft ideas, thrifty home decor and a recipe or two on occasion. You can also check out my Painting with Rit dye and Mod podge projects while you are here. Two of my favorite things to craft with. It’s been really fun to see the process and the final results. No two are ever the same. If you love budget friendly, I have a ton more ideas! 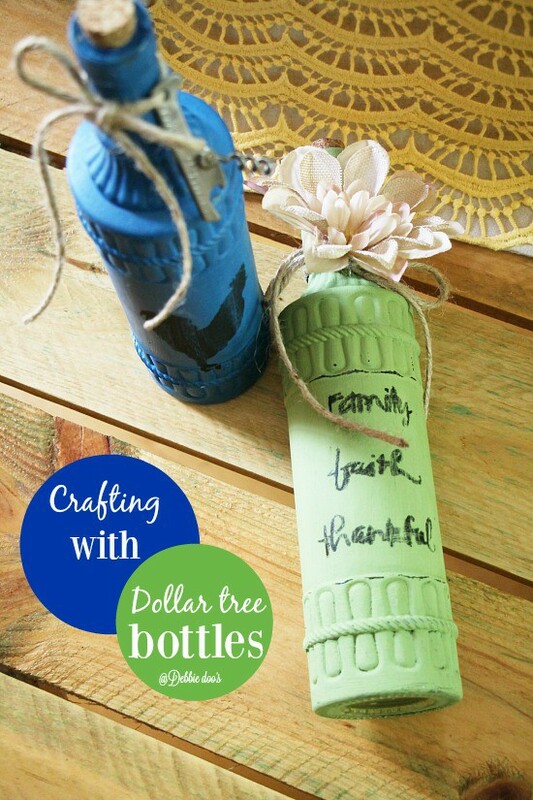 If you are interested in more bottle ideas, here are my recent Dollar tree bottle crafting ideas! 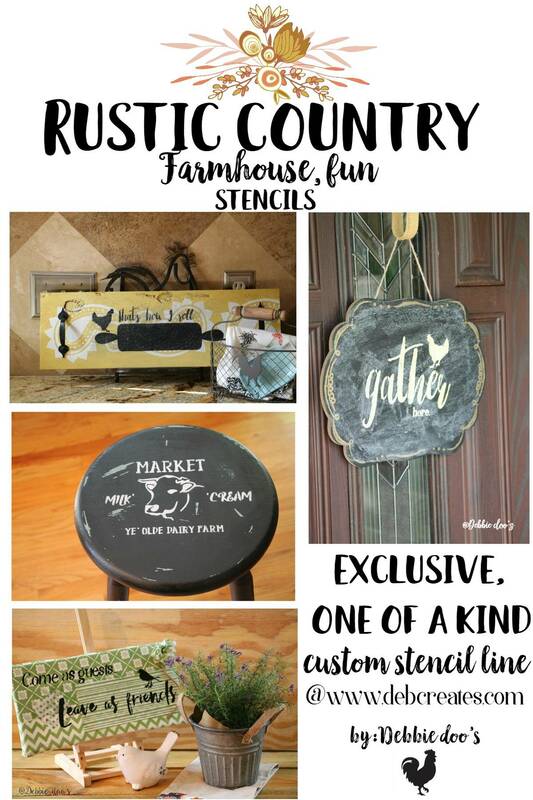 If you like stenciling, or want to try stenciling, I have the perfect new line for you to try! 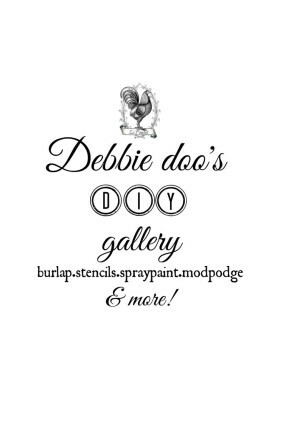 My very own exclusive Debbiedoo’s stencil line. For more details, please check out my idea and information page. 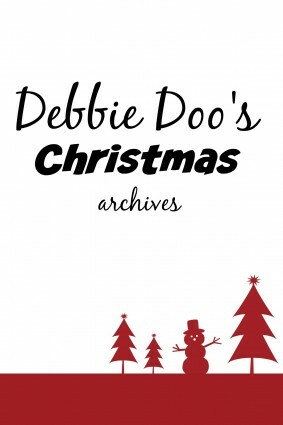 Feel free to stay awhile and rummage through my Christmas archives. YOU CAN ALSO check out my DIY GALLERY with 100’s of craft, budget friendly ideas! Spray painting, Stenciling and More! 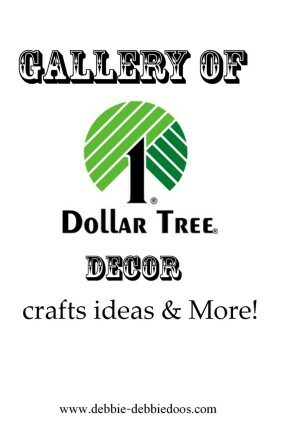 And if you love the Dollar tree..stick around and browse some more. This project is not only for Christmas. You can incorporate any color and embellishment per season. Just have fun! I am all about a little of both! 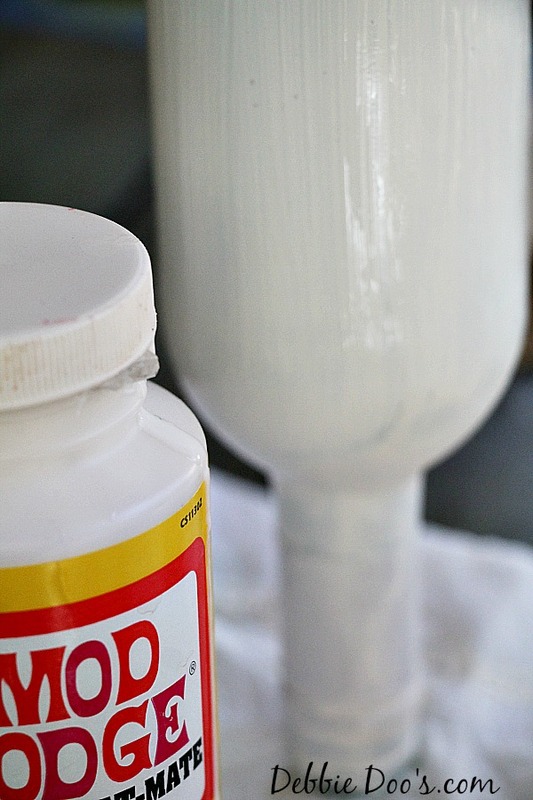 Great project – I have never mixed Rit Dye with Mod Podge. Love the look! Debbie love this idea. I’m doing a table for Christmas celebration at church and am using a snowmen theme. Can’t wait to try using red for blue. Let you know how it turns out. I tried you Dr Pepper pork chops the other night and they were a HUGH hit. Fresh turnip greens from our garden and baked sweet potatoes with cornbread. Doesn’t get any better. My friends wanted the recipe and I posted it on Facebook giving you the credit. Thanks so much. Will go in my favorite recipes to be used again and again. Oh that is wonderful! Thank you so much for sharing. That is so cool! I have all the ingredients 🙂 empty wine bottle and all! Hmmm.. corks, I will have to see what I can do with those:) Thanks Patty. Super cute as always Debbie!! Such a great idea and I have LOTS of empty wine bottles! 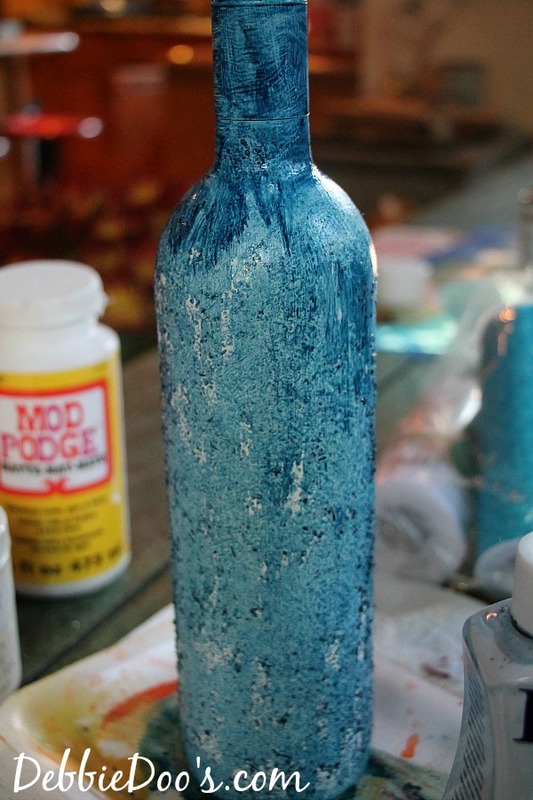 I do something similar with olive oil bottles but have a more shabby type of style. Love this rustic look! Great Suzan! Glad you like it. Love your craft. Now I have ideas to use w/my bottles. Did you put a coat of clear varnish over the finished bottles? I have some bottles (empty Young Living NingXia Red bottles) that are nice to use. I have painted some with designs, baked in the oven and then varnished. I use them to hold dishsoap. I wanted to do something different with the ones I have so this idea would be perfect. Thank you! I did not use a varnish on these. However you can. But because of the rit dye, even with a varnish, I could not guarantee that they would not run. That is a chance you have to take. Mine were just decorative with no water contact. The varnish though may hold the dye.